Our continent's penury has been proclaimed far and wide. Governments, NGOs, the media and celebrities alike have taken to the rooftops to weave their sorry tale of <?xml:namespace prefix = st1 ns = "urn:schemas-microsoft-com:office:smarttags" />Africa's woe. We've all heard the statistics. To quote just a few: More than 300 million people south of the Sahara have to survive on less than a dollar a day. Two thirds of the poorest countries in the world are in Africa, as are 34 of the 35 states with the lowest life expectancy. However this is at best not a representation of the true story and at worst a deliberate attempt to mask the real and fundamental cause of the continent’s underdevelopment. African countries harvest about two-thirds of the world's cocoa (the main ingredient for the $75 billion chocolate industry), mine 21 percent of its gold, and control nearly 17% of its oil reserves. Yet only 1 percent of the world's wealth is created in the region between the Sahara and the Cape of Good Hope. Where does it all go? To the middlemen and marketers, of course. In this way, we effectively subsidise the Western economies to a scale that dwarfs any of the agricultural subsidies paid to its farmers or any amount of aid that they would favour us with. And it doesn't stop there. We spend our money training countless doctors, nurses and other professionals only to freely send them to work in the industrialised world. We receive "aid", promptly return it in payments to the "donor" nation's companies, and then are paradoxically still left with a debt whose interest payments are mind-boggling. Between 1970 and 2002 the countries south of the Sahara received a total of $294 billion in loans. In the same period of time they paid back $268 billion, and accumulated, after interest, a mountain of debt amounting to $210 billion. In spite of the fact that the whole of Africa receives less Foreign Direct Investment (FDI) than Singapore, according to the Washington Post stock markets in Ghana, Nigeria, Botswana and Kenya consistently rank among the world's top growth markets. Let us put a break to this notion that Africa is poor. Africa is not poor. We lack because what we have is freely given away to the developed world. I do not blame the West for this state of affairs. Hey, who says no to free lunch, even in Africa? The truth is that the blame lies squarely with us Africans because we tolerate the situation and accept the rationalisations that support it. We agree to sell our raw materials on the cheap and cough up to buy back the processed stuff. Countries like Kenya allow a veritable windfall – titanium - to sit in the ground for 10 years and then award the mining contract to Western companies with little mining experience who then proceed to export the raw ore. We accept that the major international commodity exchanges be in the Western capitals that don't produce any commodity. We faithfully obey the dictates of a patently skewed market; we take the aid that is no aid at all but a form of internationally sanctioned loan-sharking; we buy the weapons that slaughter millions in pointless wars while at the same time we are busy sending peacekeepers to police the war zones of Europe. We rip off our brethren then stash their hard-earned money away in foreign banks, boosting foreign economies. This is the real Black Man's Burden - our largess. The West has no interest in solving our root problem because as we have seen, it benefits a great deal from it. So they foist on us a new agenda, namely Poverty Eradication with more depressing statistics such as a kid dying every 3 seconds. After a lot of soul-searching and wringing of hands and gnashing of teeth, they also provide us with the solution. More aid (specifically 0.7% of their GDPs- that's 7 cents out of every $1000). Some debt cancellation. More talk on market access and subsidies. Anything to avoid dealing with the central inconsistency of an entire continent sitting on a mountain of wealth and living off a pittance. In spite of the obvious contradiction, our governments and NGOs fall over themselves to implement the latest proposals, gratefully accepting crumbs as their benefactors in the West continue to feast on bread made from our wheat. In defining the agenda, the West succeeds in owning the problem. It never ceases to amaze me that any show on Africa by the TV networks always ends up interviewing some white guy from the West. According to the Washington Post article quoted earlier, "when the foreign media descend on the latest crisis, the person they look to interview is invariably the foreign saviour, an aid worker from the United States or Europe. African saviours are everywhere, delivering aid on the ground. But they don't seem to be in [the West's] cultural belief system." Anti-poverty shows always feature plenty of rich whites bemoaning the open sore that is Africa and a token black (probably an "enlightened" Aids victim or a survivor of some horrible famine) representative of the redemption a donation a few dollars can buy. Bob Geldof's Live 8 provides this telling scene as related by Margo Kingston. 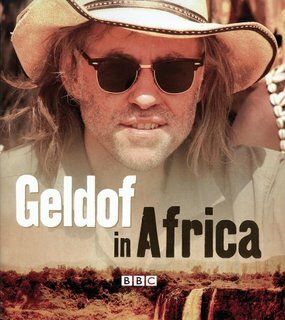 "Geldof introduced a young Ethiopian woman whose photo we saw from 20 years earlier when she was ten minutes away from death. But the moment was quickly lost; not even here could the audience be trusted with time for memory and reflection. ‘Live’ overruled Life. The young woman was led onstage to stand by as a prop to Madonna’s Like a Prayer. There was no Miriam Makeba on hand to embrace this African sister. A life ‘saved’ but now ready to aspire to the West’s idealized image." Like the poor Ethiopian, we have become props to the West's struggle with its conscience. Africa is the stage where they seek absolution for their past misadventures as Parsaselo Kantai amply demonstrates in his insightful article, Death of a Kenyan Dream. They do so, not to relieve our suffering, but theirs. In this drama, the African has been assigned his stock role of "the noble savage" needing to be rescued from himself while the West is cast as the heroic, self-sacrificing (the whole 7 cents) harbinger of civilisation. Having accepted our role and donned the costume of moral and material bankruptcy, we have come to rely on the West for answers to everything. When an organisation is insolvent, bring in some Westerner and hey presto! Problem solved. Endemic corruption? Why, let’s get some Western “experts” to advice us. Famines and disease? Here come the white messiahs riding on their standard issue luxury 4X4s and receiving hefty allowances to compensate them for the hardship of exchanging a council house in London for a palatial residence in Muthaiga with several servants thrown in. Faltering economies? Blame the whole thing on slavery and colonialism. Claim reparations. Sue their imperialist asses. Wait for the handout. Thus Western guilt and greed conspires with African naiveté, incompetence and thievery. Africa needs to wake up and wrest back the problem. It is our problem, not the West’s. The solutions will come from us, not them. "Fair trade", debt relief, removal of subsidies and "aid" cannot be anything other than a band-aid on a gaping wound. We need to extract ourselves from a global trade system that is bleeding us dry. Africa needs to be run for the benefit of Africans, not modern-day imperialists. The Virginia Center for the Teaching of International Studies whose central purpose is to enhance the teaching of international studies in Virginia's middle and high schools, thinks that Grade 8 kids in the US should be able to "identify minerals in Sub-Sahara Africa, explain how man uses these minerals and how developed nations need these minerals, identify minerals that are strategically important and examine factors that limit Sub-Sahara Africa from becoming more industrialized and using these mineral resources themselves (italics mine). I would recommend the same course to the Grade A idiots who represent us in international forums and their bosses in our governments and NGOs. A Physics and Maths graduate, Gathara is a Kenya-based cartoonist and journalist. He blogs at Gathara.